Preheat the oven to 180ºC fan bake. Line a 22cm cake tin with baking paper. Cut the apricots into segments. Beat in the eggs, one at a time, along with the vanilla. Gradually fold in the flour and ground almonds. By hand, fold through the chopped basil leaves. Pour the batter into the cake tin and dot in the apricot segments. Bake for approximately 40 minutes. The cake is ready when it is golden in colour, springy to the touch, and a skewer inserted in the centre comes out clean. Allow the cake to cool for around 10 minutes before turning out onto a cooling rack. Meanwhile, make the icing. In the bowl of an electric mixer, beat the cream cheese with the vanilla until perfectly smooth. Fold through the apricot jam leaving some ripples. 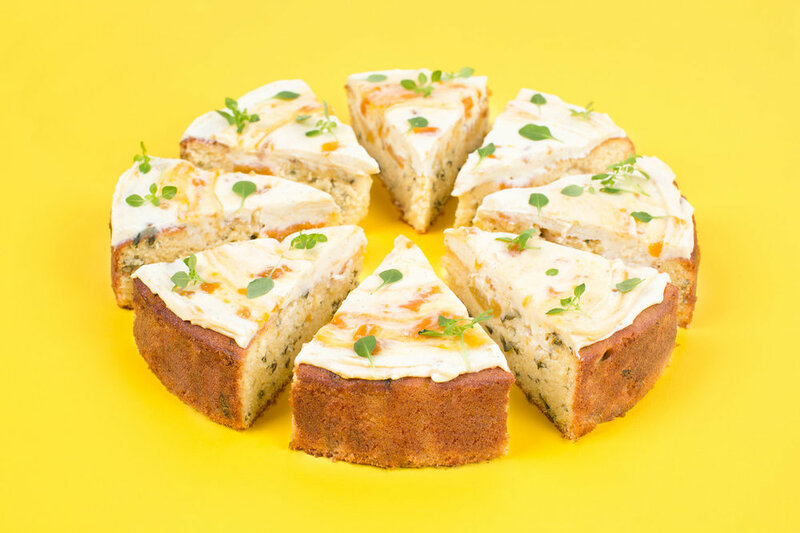 Once the cake is fully cool, apply a generous layer of the icing and decorate with fresh basil leaves. My Top Three Baking Tips!